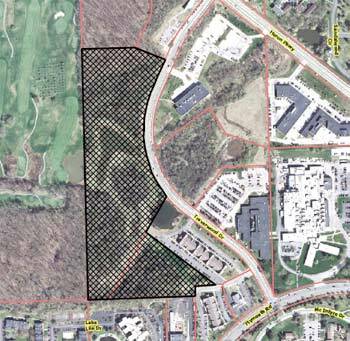 A residential complex on the west side of Traverwood Drive, north of Plymouth Road, has now received all the necessary approvals from the Ann Arbor city council. First Martin’s Traverwood Apartments is estimated to cost $30 million, and would include 16 two-story buildings for a total of 216 one- and two-bedroom units – or 280 total bedrooms. Eight of the buildings would each have 15 units and 11 single-car garages. An additional eight buildings would each have 12 units and 8 single-car garages. The council approved two separate items on its Jan. 6, 2014 agenda related to the Traverwood Apartments project – one for the rezoning required for the project, and the other for the site plan and wetland use permit. At the council’s Dec. 2, 2013 meeting, the initial approval of the required rezoning had already been given. The site is made up of two parcels: a nearly 16-acre lot that’s zoned R4D (multi-family residential), and an adjacent 3.88-acre lot to the south was zoned ORL (office, research and light industrial). It’s the smaller lot that needed to be rezoned R4D. 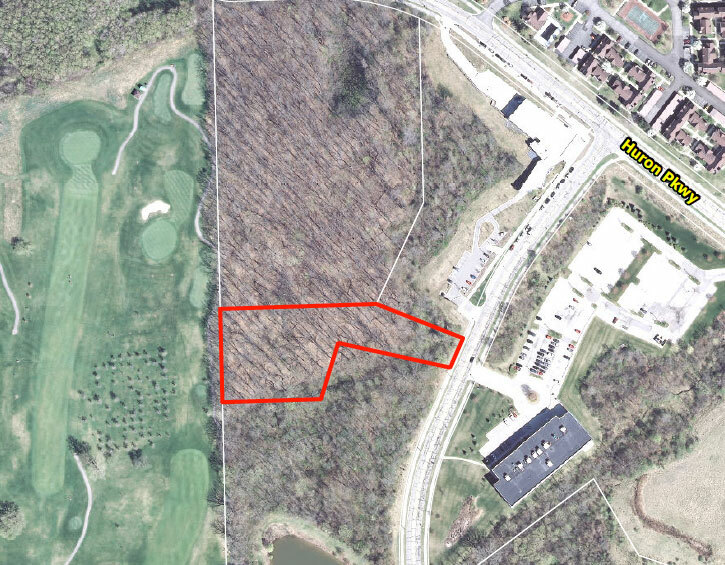 Also approved at that Dec. 2 meeting was a donation of 2.2 acres, just north of the project site – by Bill Martin, founder of First Martin Corp., to the city. The donated acreage is next to the Stapp Nature Area and the Leslie Park golf course. The city’s planning commission recommended approval of the site plan and the required rezoning at its Nov. 6, 2013 meeting. Land donated by Bill Martin to the city of Ann Arbor indicated in red outline.